Craughwell AC's medallists at the National U20 and U23 Championships in Tullamore: Caron Ryan, U20 national 5000m champion; Chloe Casey, bronze medallist in the U20 shot putt; Conor Duggan, bronze medallist in the U23 200m; and Sinead Treacy, silver medallist in the U23 200m and 400m. Galway athletes secured national silverware in the junior and U23 championships in Tullamore at the weekend, kickstarting the 2018 Track and Field Championships. Three individual national golds were the highlight, firstly from Galway City Harriers athlete Nicole King who showcased her great talent to claim gold National gold in the U23 400m event with a fast 56.42, Brendan Lynch of Loughrea AC also won a national title with victory in the junior men’s 400m hurdles, and Veronica Burke of Ballinasloe and District AC continued to impress, winning the U23 women's 3000m walk. Craughwell AC also secured top overall junior women's club team at the event, which means they are now eligible to compete at the European Clubs Track and Field Cup in Portugal in September. Cillin Greene of the city club sprinted to silver in the U23 200m, while clubmate Jack Dempsey won bronze in the junior 100m final, clocking 10.79. Dempsey has been selected on the Irish 4X100m relay team for the World Youth Championships to be held in Finland this month. 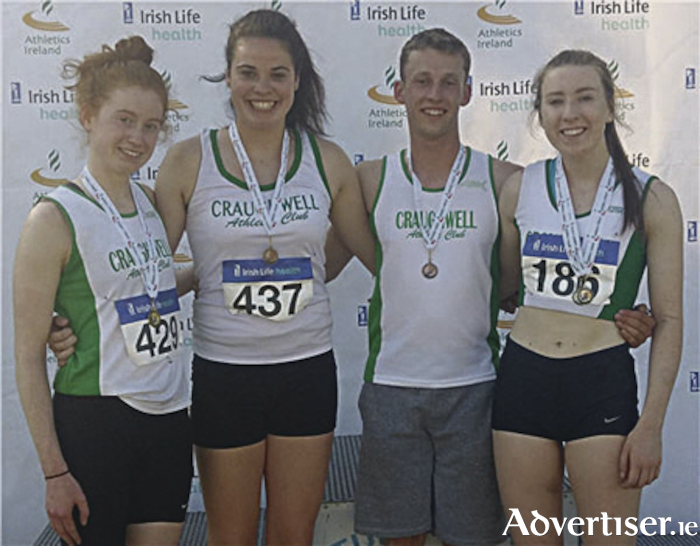 Craughwell AC’s U20 and U23 athletes were in flying form, taking home five individual medals, and two sets of relay medals. In the U23 events, Sinead Treacy raced to double silver, in the 200m final in a time of 25.60 and again in the 400m final in 59. 31. Conor Duggan showed he is right back to form after a long injury lay off, securing bronze in the U23 100m. Caron Ryan took gold in junior 5000m in a time of 19:01.54, while Chloe Casey stepped up age groups from U17 to U20 and secured a brilliant bronze in the shot putt with a throw of 10.64 and later placed fourth in the discus. Craughwell AC secured bronze in both women’s relays - their 4x100m team in a time of 52.45 with Freya Bohan, Chloe Casey, Aisling Keady and Laura Cunningham on the squad, while the 4x400m team did likewise in a time of 4:24.06 with Arlene Earls, Lorraine Delaney, Shauna Tobin and Ciana Reidy scoring. NUIG athletes also performed with distinction, Ciara Barry of Crusaders AC & NUIG won U23 400 hurdles silver and 200m bronze, and sprint hurdler Sarah Quinn (St Coleman’s Mayo and NUIG ) won a bronze medal over the 100 hurdles. Day one of the National Juvenile Track and Field featured the national paired team events and relays for U9s, 10s and 11s, along with the U12 and 13 Field events. Darragh Fahy of Loughrea AC showed his class, winning gold in the U12 long jump with a best of 4.60 metres. Craughwell AC athletes had tremendous success across the programme, and Darragh Kelly secured a brilliant individual high jump title in the U12 with a leap of 1.45m. In the paired events Craughwell secured multiple medals. Emma O'Donovan and Lauren Kilduff took gold medals in the U11 long jump; Ben Moran and Dara Zimmerer took silver in the U11 long jump; and Lauren Morgan and Mia Hollingworth did likewise in the event. Girls Long Jump with leaps of 3.56m and 3.41m. Calum McMahon and Alan Hallinan took bronze in the U9 60m paired event, and added a superb silver medal in the 300m. Tuam AC Juveniles also enjoyed great success . At U12 level Danielle Moynihan won silver with a superb clearance of 1.36 metres in the high jump in the U9 events, the girls pair of Eimear Fallon and Rachel Treacy won silver in 300m, while in the boys, Eanna McGrath and Cian McGinn won bronze in the 300m. Tuam U9s boys' relay squad struck bronze with the team of Cian McGinn, Thomas Riordan, Eanna McGrath and Odhran Kelly. Galway City Harriers pair of Juno Hayes and Elisa Jaime Stapleton produced a super performance to claim bronze medals in the U11 60m teamed pairs. The two main events featured the 100m and elite miles, with Richard Kamson of GCH winning the men’s race and Majella Loftus of GCH first home in the women's event. Irish international Paul Robinson of St Cocas AC pipped Ennis Track’s Rory Chesser in an exciting men’s mile race, won in 4.21 on the grass track. Third home was Kevin Chesser also of Ennis. Christine McMahon won the women's mile, ahead of Jean O'Connor and Tara Whyte, both of GCH. This year’s Headford 8k Charity Road Race takes place on Saturday at 7pm, marking the 14th anniversary of this popular road race with proceeds supporting people with intellectual disabilities. The race course is accurately measured and has an Athletics Ireland permit. Race headquarters is at the GAA pitch in Headford town on the Shrule Road, with changing and shower facilities available. Registration for the event online is at https://www.active.com/headford-cogalway/running/distance-running-race, with limited entry on the evening from 5.30pm at the GAA pitch.